Can the push for local food on campus challenge corporate control? 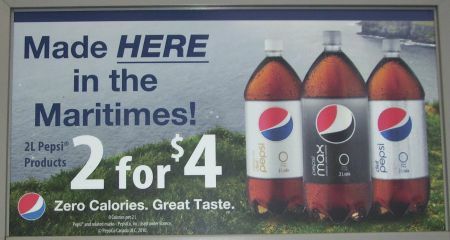 Pepsi: part of the local food movement? The Nova Scotia Agricultural College (NSAC) - a campus surrounded by farmland and full of experts on food production - feeds students, faculty, and staff produce from thousands of miles away. “As an agricultural institution, we should be growing our own food on campus,” says Keltie Jones, NSAC's Associate VP Academic for Students. But the multinational company Chartwells runs food services at NSAC, and local food does not easily fit into the multinational paradigm. The local food movement is gaining popularity, however, and businesses big and small are trying to get in on the action. Chartwells has responded to the NSAC community's desire for local food by agreeing to use some produce from a campus garden and sourcing a few items locally for their cafeteria and conference menus. Chartwells page on the NSAC website lists a number of local suppliers including Kittilsen's honey from Debert, Stirling apples from Wolfville, Valley mushrooms from Waterville, and Pepsi. Yes, Pepsi. The multinational’s allegedly local status pushes up against questions of what can be considered progress for the local food movement, both on and off university campuses. With an exclusive Aramark contract in place for cafeterias and catering, and Pepsi and Sodexo contracts tying up the Dalhousie Student Union (DSU), students at Dalhousie University in Halifax have encountered many barriers to accessing the food they want to eat. Last year, Campus Action on Food (CAF) was active in speaking out against the dominance of corporate food on the Dalhousie campus. Despite threats of being shut down, CAF challenged the corporate monopoly on campus food by serving free, mostly local organic meals; rallying students to take back control of campus food choices; lobbying against the renewal of Pepsi's contract with the Dalhousie Student Union (DSU); and installing a food-producing container garden on campus. At the end of the year, CAF members were discouraged by the results of their battle with bureaucracy. Pepsi's contract was renewed, campus food service contractors refused food produced in CAF’s garden, and many of the group's members saw the need for a new approach to achieving their goal of improving food choices on campus. A number of students involved in CAF have formed a new group: the Loaded Ladle. The Loaded Ladle is building on what CAF started last year, but with a different tactic. Whereas CAF has had an antagonistic relationship with the DSU, the Loaded Ladle has “a good relationship with Dal,” says group member Katherine Marsters. In January, the DSU approved a referendum question proposing a levee fee for the Loaded Ladle to support the group serving free, locally-sourced meals to students. Dalhousie students will vote on the question in March. The Loaded Ladle has also approached the DSU with a business plan that proposes a permanent location for the group in the Student Union Building. The DSU has made no commitments in this regard and has extended Sodexo’s contract for the building - but only for one year. This gives the DSU time to explore other non-corporate food options and the Loaded Ladle time to get further organized. While corporate influence on campuses continues, groups like The Loaded Ladle at Dalhousie and the student-initiated campus garden at NSAC are beginning to find creative ways of bringing their values to the cafeteria 'table,' and leaving Pepsi off the menu. Submitted by Megan Kinch on Thu, 02/24/2011 - 23:25. Is there a relationship between these local food struggles and workers for Aramark and Sodexo? Cafeteria workers are pretty fucked over, usually with low wages and bad working conditions, and I know there have been struggles over unionization at other universities. Great opprotunities for student/worker solidarity there, the workers have the power to go on strike and the students do really effeictly pressure the university and mobilize the puble. Is there any connetions being made between these things at Dal? Submitted by judy (not verified) on Sun, 02/27/2011 - 07:14. Submitted by Orion in Halifax (not verified) on Sun, 02/27/2011 - 16:56. I couldn't agree more Megan. I'm a member of the Loaded Ladle and while we have yet to seek out or be sought out by Sodexo workers I think the willingness is there. I think it is obvious to anyone who stops to think, that "Ethical Food" isn't just about the treatment of the environment, but the treatment of people too. For food to be ethical is has to be produced and handled by workers with just and empowering working conditions. I'm sad to say that so far my worker/student solidarity has only consisted of a few jokes or pleasantries across the cash register and that's far from the norm. Usually we look grim and harried round the eyes on both sides of the counter, and both a little embarrassed by the greasy lumps of food and money we're exchanging. The DSU has a still has a long way to go towards good food on campus, but I think the spirit is here now and the path is an exciting one.